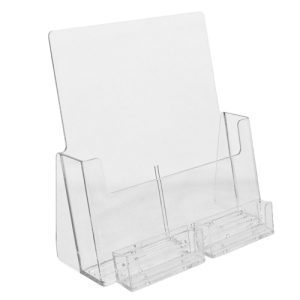 The Countertop Model Single Pocket Full-Page Brochure Holder w/ 2 Business Card Holders maximizes your display value. 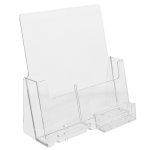 This brochure holder is perfect for 81/2” x 11” literature with two pockets attached to the front; ideal for two separate business cards or a combination of gift card / coupon cards. 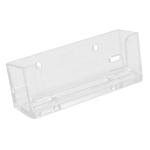 Its compact design allows maximum display area in one elegant, affordable brochure holder. Display two business cards, coupons or gift cards with your information. 8 1/2'' x 11'' brochures, booklets, magazines, leaflets, feature sheets, single sheet copy, or menus. Realty offices, church lobbies, restaurants, banks, professional offices, gas stations, kiosks, insurance brokers, agencies.